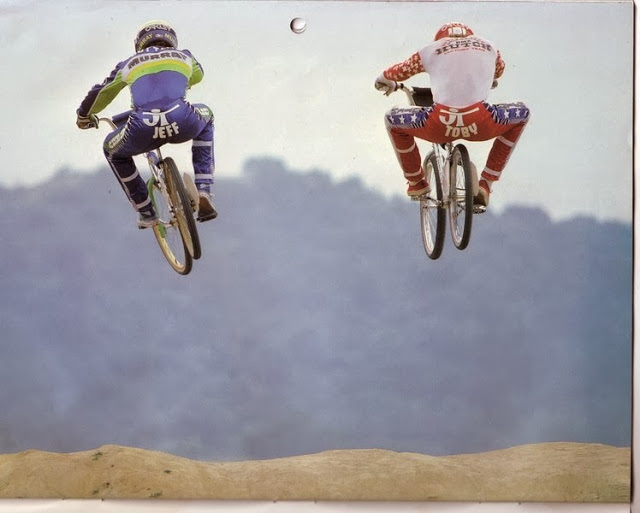 I can stare at early 80s-era BMX magazine photos like this all day long. Back in the day I used to dream of getting the full-factory ride like all the legends that filled the pages of BMX Action and BMX Plus. Two of the “factory hot shots” of the time were Jeff Bottema and Toby Henderson. Here they are, looking as factory as can be, getting some serious boost and tucking in behind the seat for extra style points.